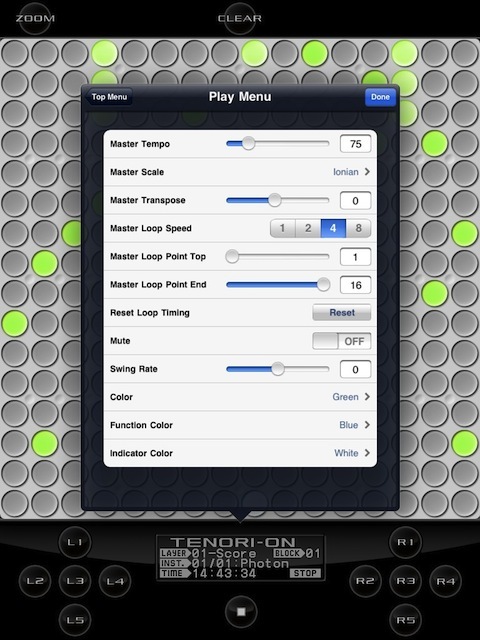 TNR-i is a universal iPad and iPhone app from Yamaha. Want a Tenori-On? Don’t we all. The musical wonder toy has been the envy of musical geeks across the globe for quite some time now. In case you don’t know what a Tenori-On is (and don’t worry most people don’t avidly scour the pages of Sound on Sound to learn these things and live much better lives as a result) the Tenori-on is an electronic musical instrument, designed and created by Japanese artist Toshio Iwai and Yu Nishibori of the Music and Human Interface Group, Yamaha Center for Advanced Sound Technology. You might know Iwai’s previous work, such as his Electroplankton software for the Nintendo DS, which in a similar fashion to the Tenori-on plays with light and sound and looks quite pretty. 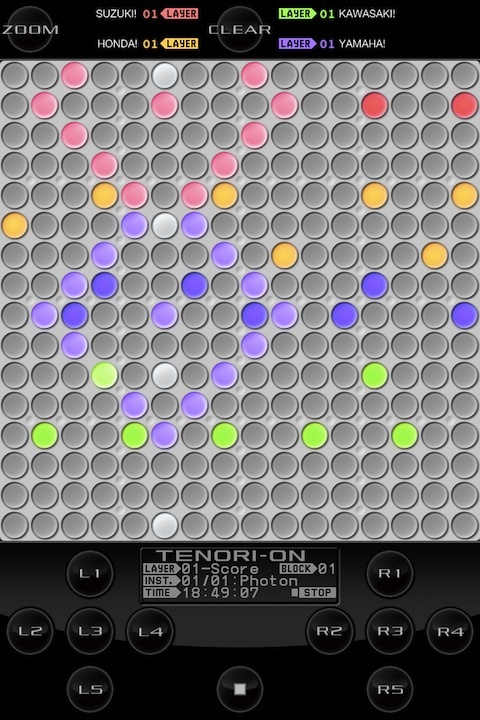 The Tenori-On is a hand-held screen, comprising a sixteen by sixteen grid of LED switches, any of which can be activated in a number of ways to create sounds. The LED switches are held within a magnesium or plastic frame, which has two built-in speakers located on the top of frame, as well as a dial and buttons that control the type of sound and beats per minute produced. One will set you back about £700. Roy uses one in the FriendFace episode of the IT Crowd despite being a lowly paid IT worker. Anyway, Tenori-ons are a perfect mix of creativity and cool so it’s not surprising they’ve found their way onto the iPad in app form. 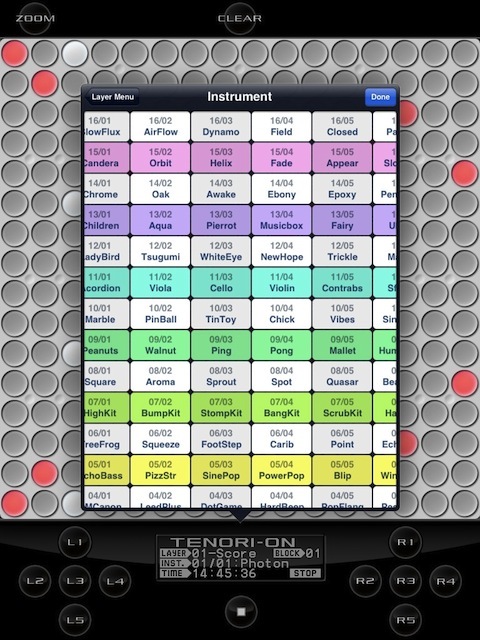 In fact there are a number of apps that recreate Tenori-On functionality. TNR-i however, has the stamp of authenticity from Yamaha and brings a little more to the table than standard clones. It’s really easy to make music with the TNR-i – even if you don’t know anything about music (although that doesn’t seem to be the market we should be reaching out to). The TNR-i does an amazing job of combining sound and space, with glowing buttons enabling you to visualise music. On the grid the horizontal dictation is time and the vertical direction is space. It’s pretty much like working with any step-sequences except it’s more visually appealing and the flashing lights can be incorporated into performance art. The TNR-i is polyphonic and you can have 16 types of sound at the same time due to its layer system. You can arrange song blocks and switch between them on the fly to perform live songs. It’s easier than programming a 303 but a tad fiddly to work unless you’ve sat with the manual for a good 15 minutes. The TNR-i comes with six different input modes. I was most at ease with score mode, where you simply arrange sounds on the grid like a traditional composition. You can throw cation to the wind with random mode and watch the melody and rhythm evolve before you. There is also a draw mode where you can trace images which then translate into sounds and solo mode where you can play with the speed of repetition and pitch. And if the random mode wasn’t crazy enough for you, can try bounce mode where the glowing lights are like bouncing balls producing sound where they might fall. Trippy. If this wasn’t enough you can take advantage of some of the iPad magic (it works all recent iOS devices but you really appreciate the extra real estate of a tablet) by connecting to a network and jamming with other TNR-i owning friends (up to four) over Game Centre and noodling away. The TNR-i is far from cheap and at $19.99 (£13.99) there are other cheaper or even free Tenori-on clones that give you that same “making pretty beeping sounds over bubble wrap” feel. However if you want to make some seriously creative music and add an extra element to some of your performances than I can’t recommend “the real deal” highly enough. AppSafari review of TNR-i – US iPad app review was written by Shem Pennant on September 5th, 2011 and categorized under App Store, Featured, iPad apps, Music, Universal. Page viewed 4580 times, 1 so far today. Need help on using these apps? Please read the Help Page.